Mulroy led all Olympic Conference players in scoring and guided Lenape to a South Jersey Group 4 championship in 2018–19. On Jan. 10, Lenape High School girls basketball was looking for a big play in the final seconds of regulation against rival Cherokee High School. Cherokee had made a pair of free throws to tie the game at 33–33 with about five seconds remaining. Rather than call a timeout, Lenape quickly inbounded the ball to senior Shannon Mulroy. Mulroy sprinted down the floor and through the stunned Cherokee defense as she headed toward the hoop for a layup. Mulroy let go of the ball just before she was knocked to the floor and the clock hit zero. The shot went in and Mulroy’s teammates piled on top of her to celebrate Lenape’s 35–33 victory. That moment was one of several where Mulroy showed her true greatness this season. 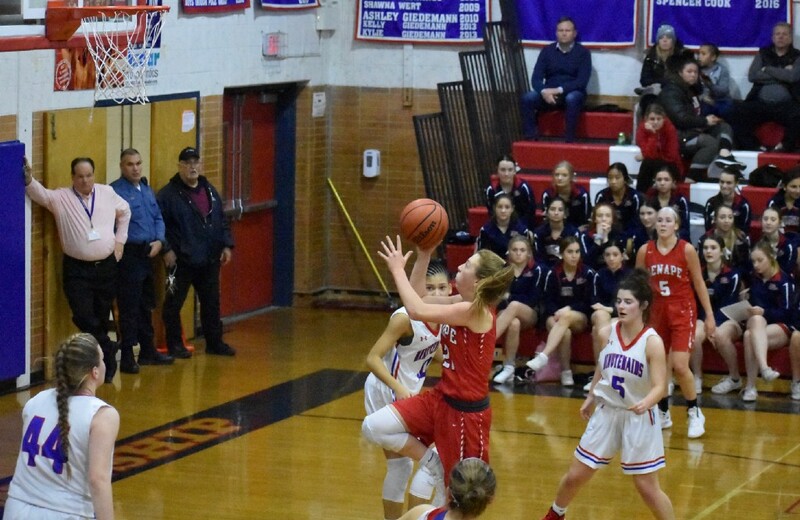 The four-year varsity player was the Olympic Conference leading scorer in 2018–19 and guided her team to a South Jersey Group 4 championship. But Mulroy’s ability to come through in the clutch is what separates her from other top players in the region and makes her The Sun Newspapers 2019 Girls Basketball Player of the Year. Head coach Rob Hummel described Mulroy’s work ethic as old school. Looking back at the Jan. 10 game, Hummel said the moment happened because of Mulroy’s outstanding instincts and unflappable confidence. Mulroy said her competitiveness dates back to very early in her childhood when she would play basketball with her brothers in the backyard. 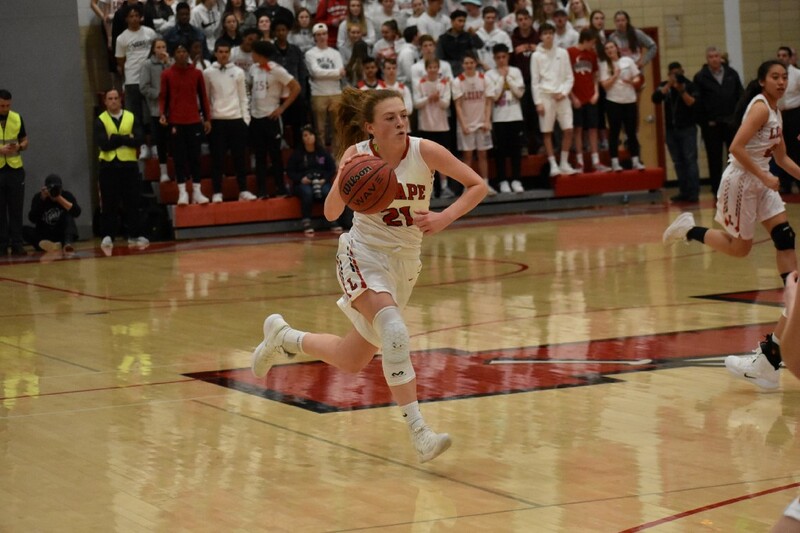 As a freshman, Mulroy played an important role off the bench for Lenape as the team won the Group 4 state championship. Her involvement in the offense grew as a sophomore and junior until this season, when Hummel handed over the keys to her. At the start of the year, Mulroy was a scoring dynamo for the Indians. She tallied at least 14 points in 17 of the team’s first 20 games and made herself known as one of the most dangerous players in South Jersey. Mulroy embraced dishing the ball to her teammates. This was most apparent in the South Jersey Group 4 championship game, where Mulroy had just as many assists (six) as points scored. Mulroy led her team to one more win in the NJSIAA Group 4 state semifinals against Middletown South. After Lenape lost a double-digit lead to fall behind in the fourth quarter, Mulroy took over, scoring all 10 of Lenape’s fourth quarter points to lead them to a 51–47 win. Mulroy finished the game with 23 points in all. Lenape wasn’t able to replicate its 2016 success in the Group 4 state championship team as the Indians lost against undefeated Franklin High School, but the loss doesn’t dampen Mulroy’s resume one bit. In her four seasons at Lenape, the team won 100 games, two South Jersey Group 4 championships and a 2016 Group 4 state championship, the only state title the Indians have ever won. Individually, Mulroy finished her career with 1,142 points, 472 of which came in just this season. Next year, Mulroy will take the court for Cornell University, a school she verbally committed to last summer just a day after visiting. As she closes the book on her high school career, Mulroy walks away with many happy memories, from the three championships she helped the program win to laying on the floor in jubilation after winning the Jan. 10 game against Cherokee. “When it went in, celebrating with my teammates is something that I’ll remember forever,” Mulroy said.